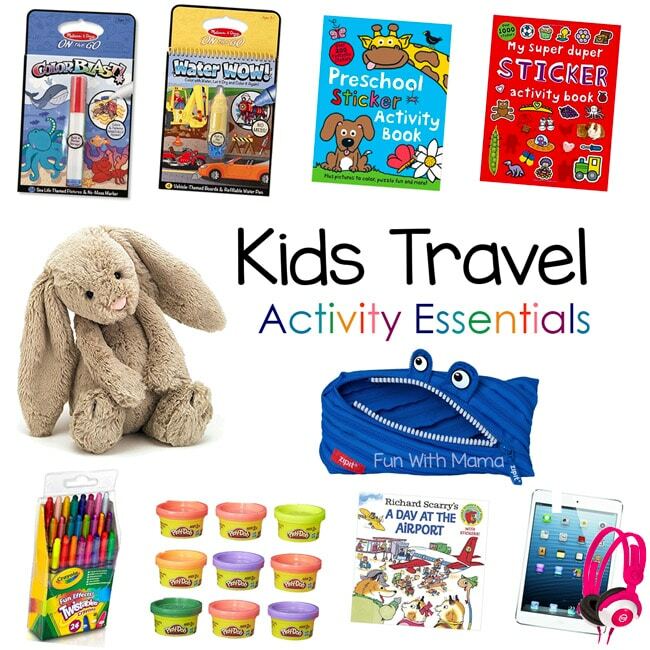 These baby travel essentials and toddler travel tips have been compiled after a lot of airplane traveling time with kids.Are you looking for the ultimate kids travel essentials? 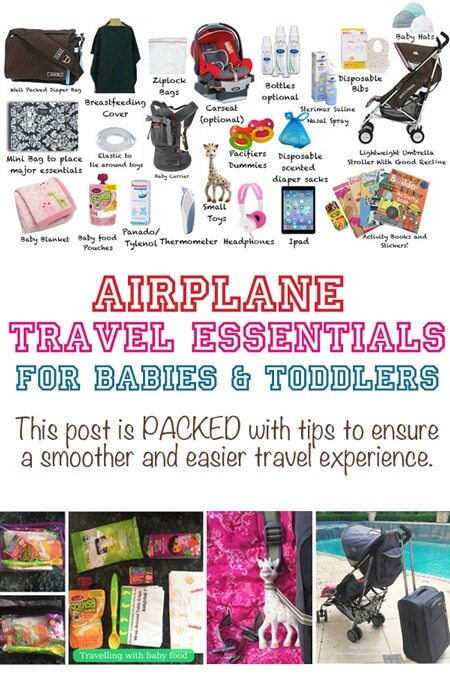 This packing list includes tips for flying with a baby as well as a list of toddler and baby travel essentials. If you are wondering, how do you travel with a baby? Then I promise you, it’s really not that hard if you prepare yourself. 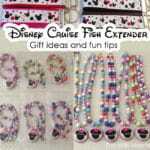 You can check out this other post for carry on luggage ideas when you travel with kids. As a Mom who is constantly traveling with kids I have a ‘been there done that’ kind of attitude now that I have taken over 30 international flights with my kids. 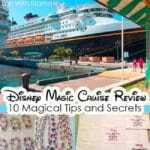 My most recent kids travel experience was on a Disney Cruise ( Disney Magic Cruise Review and Tips ) and it was wonderful. 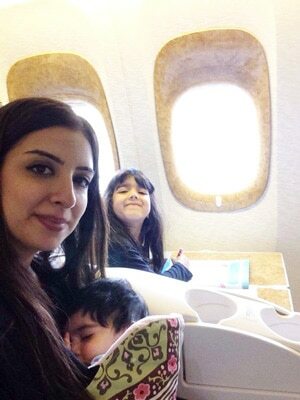 Most of the time my spouse travels with us but sometimes, I am traveling all by myself with three little ones. 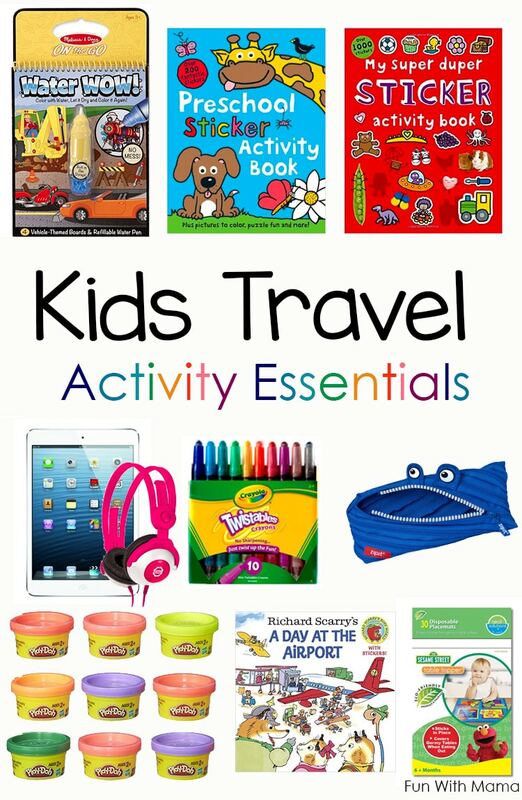 I have listed out my favorite toddler travel essentials and kids travel activities geared towards a baby, toddler and preschooler. Do not be scared to travel with kids on a plane. It is really not as difficult to do if you come prepared. These travel with kids tips helped me get through those 30 international flights. Are you feeling stressed about your upcoming travel or even possibly dreading it? This is completely normal and I felt that way too. While it may be challenging to travel with a baby and young kids there are definitely ways to ease the journey and make it less stressful. Check out my flying with kids travel tips in the video below. Based on my experience and what now seems like an expertise in flying with children I can offer you some advice. The below products are what I usually have on my check-list before I leave for my trip. Traveling with toddlers doesn’t have to be hard! 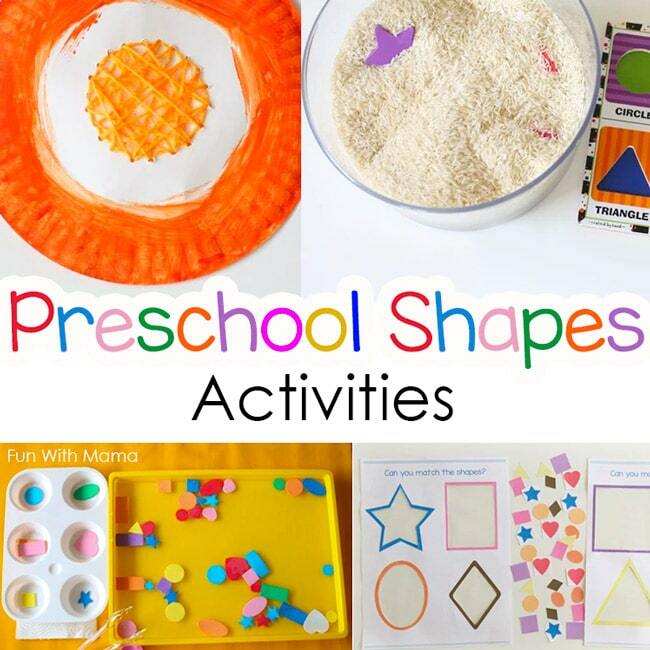 Before we start, I assume you have an adorable baby at home, a lively little toddler or a preschooler who loves activities! 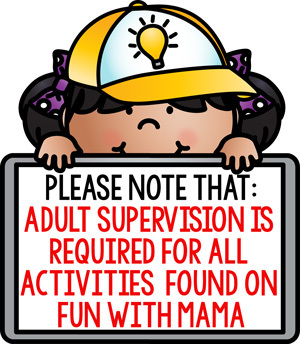 If you do, then don’t forget to stop by our baby activity section as well as our toddler activity section of the blog. 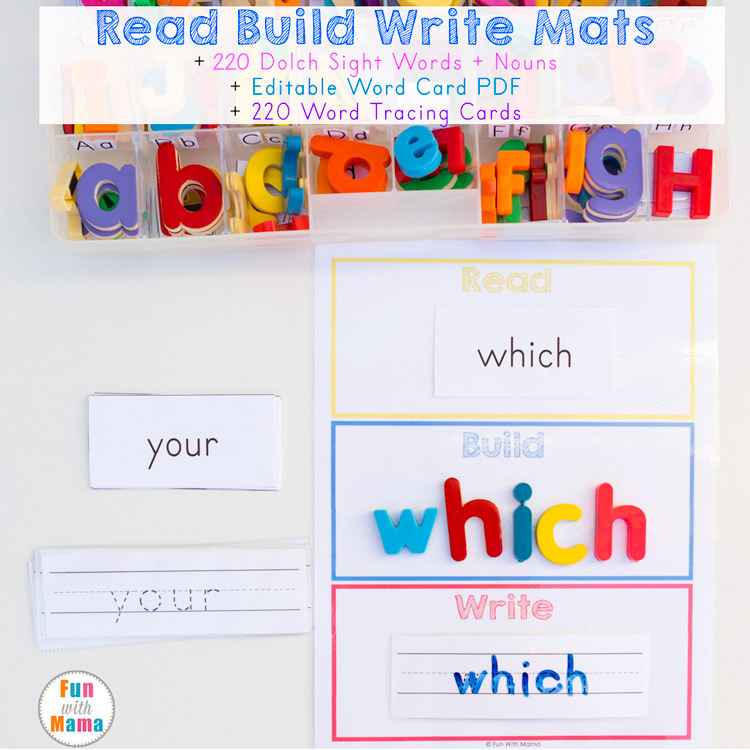 I promise you that the printable kids activities will save your sanity once or twice. 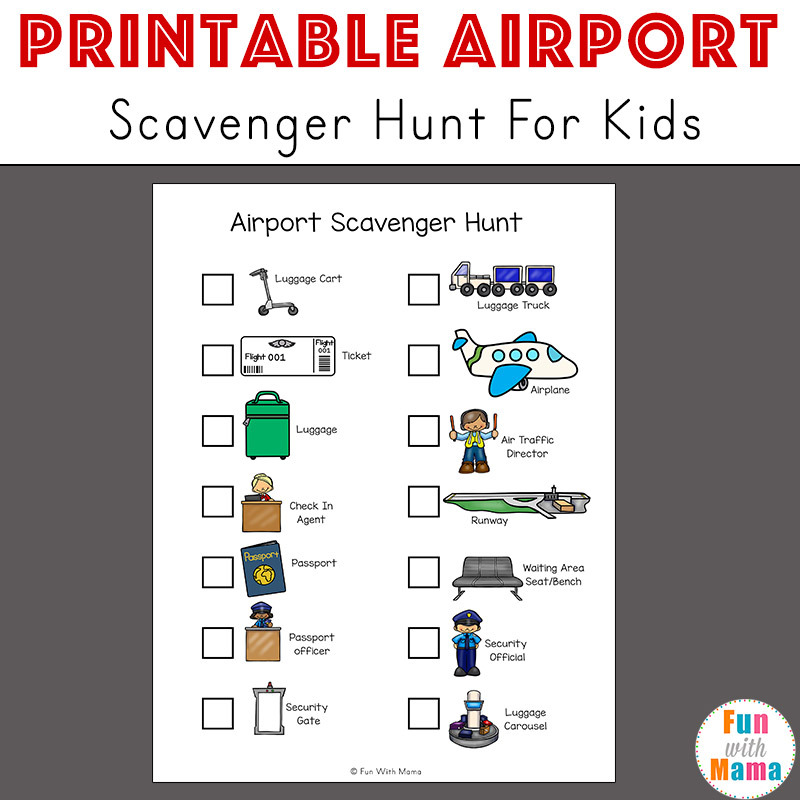 You could even print out a few of these kids activities as airplane activities. 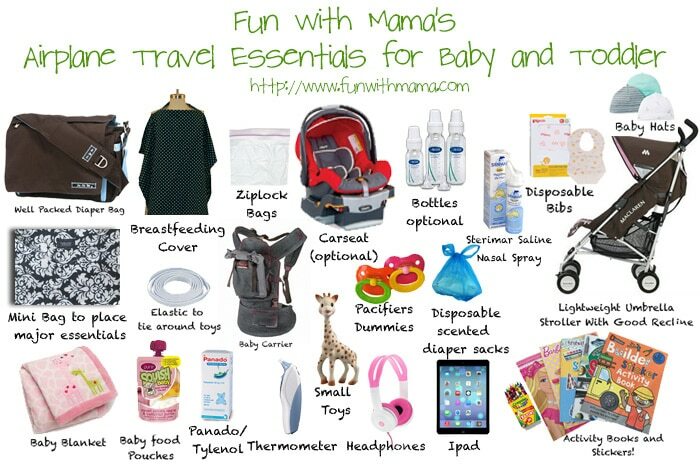 Hopefully this travel with baby checklist will help you out. 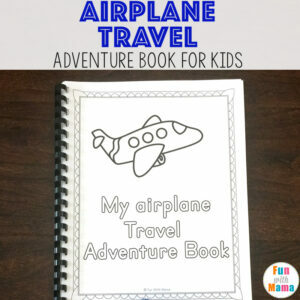 If you have a toddler, preschooler or child between the ages of 2-9 then don’t forget to grab the free printable airplane travel activity book. You could also check out the airport scavenger hunt here too. First thing: The right mental state. Traveling with a baby is not as hard as you think it might be. 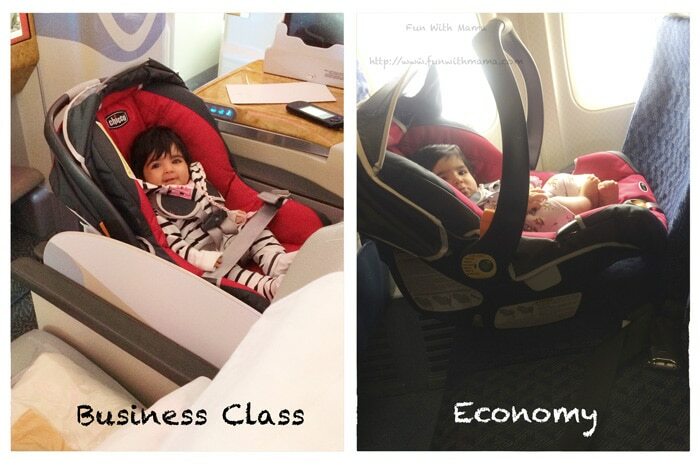 I actually really enjoyed whenever we did travel with a baby because, the younger they are.. the easier they are! The first thing that you need to do is to make sure that you tell yourself that the journey to your destination will not be too long and that you will get through it and reap the benefits of the lovely holiday away. If your child acts up keep that in mind. Some kids naturally feel sleepy and nap a lot. In that case you won’t even have to worry (1 out of 3 kids for me!) Most of your travel struggle is in your mind. Be confident about your capabilities as a Mother and you will get through it with flying colors. Disclaimer: The links contained in this post are affiliate links. I recommend these products because I have purchased them myself and love them. This is what I take with me when I travel. We love this Travel DVD player for some airplane downtime. Some may find this list excessive. I wont deny that my list is very thorough. (I am a very organized person.) You can pick and choose what you think you will personally need. While you may not need all of these things I promise you that having these on hand will make things seem SO much easier for you and it will make the journey go that much more smoothly. All of these products are listed in my Amazon store for easier access and convenience for you! 2. Well packed diaper bag: I love my Jujube BeAll Diaper bag and it has gone through my three kids still looking like new. Clothes– Pack at least two or more change of clothes depending on your travel time. Also bring at least one long sleeved vest. Diapers and wipes– Bring at least twice the amount of diapers you would normally need. Some babies get a running stomach while in the air. For your holiday I would bring one big wipes pack and for your diaper bag a small travel size one. Refill your travel size one with wipes as needed during your holiday. Saline nasal spray– spray each child’s nostrils before take off. My pediatrician says that it keeps your child’s ears from hurting as much and coats the nasal passages so it’s less easy for germs to find their way in. Thermometer– fevers always pop up at the most inopportune time. I use a Braun Ear Thermometer and love it. Medicines in a ziplock bag with dropper– We take Tylenol/Panado and Allergex. 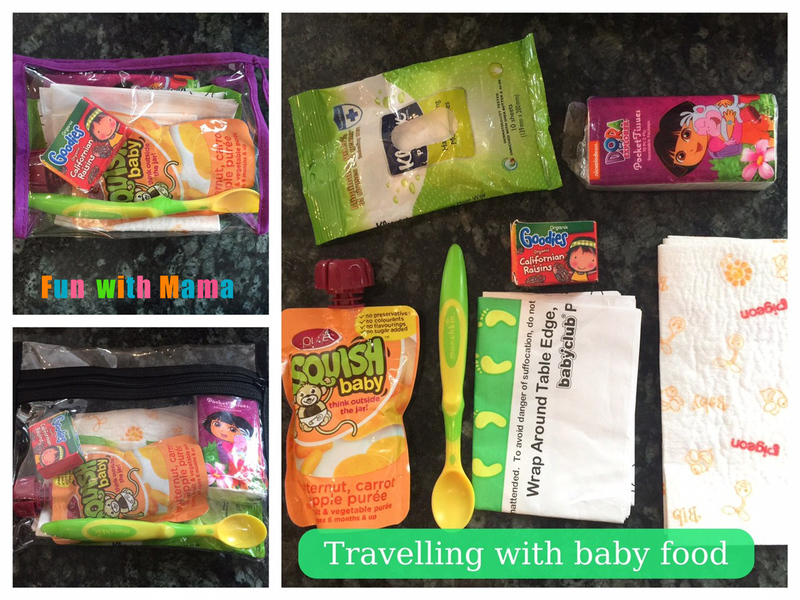 Baby Food– I just buy the pouches of baby food to use on the airplane. Plastic Cosmetic Type Bag for baby food -I place my baby food in a separate small plastic zip bag. It includes: two pouches of food (I used pure Squish baby food below but also use Ella’s Kitchen), two disposable bibs, two plastic spoons (munchkins is my favorite), tissues and face wipes. I take out whatever I need from here and place it on the side of my seat so it is all easily accessible while I’m feeding the baby. When I’m done I throw whatever is leftover into the scented diaper trash bags (except for the spoon which I wipe off when I wipe babies face with a tissue), tie it up and leave it aside. These organizer pouches look like they would work well. Jacket/sweater – It gets really cold in the airplane so I like the kids to be wearing a nice cozy and comfy sweater or gap jacket. Hat– to cover babies ears from the harsh air conditioners in the plane. 3. Breastfeeding cover– I have my Posh LiL’ Diva breastfeeding cover with me at all times. The air hostess normally makes me put my diaper bag into the luggage hold during take off and landing (for safety reasons) but I keep my Snuggle Wrap Bag next to me. It’s so small that the air hostess never complains. In that bag I have my feeding cover, two diapers and small travel wipes. 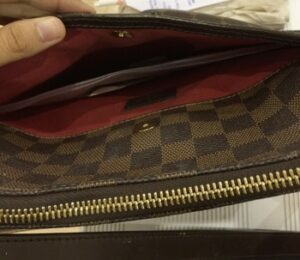 I cannot travel without this bag! (It’s like a bare necessities diaper bag). Join my facebook page, I often recommend products that I LOVE! Since Posh LiL’ Diva is no longer in existence you can try Bebe au Lait for feeding covers but they don’t come with a bag. I have used Bebe au Lait feeding covers for over 6 years and they still look as beautiful as they were when I purchased them. Soft Structured Carrier – Ergo Baby Carrier or a Kinderpack. I have travelled to many countries with my Beco 4th Generation carrier but because the design and features have changed for the newer models I would prefer to recommend the other two because they are most like the Beco model that I have. Depending on how many kids you are traveling with and if you have a stroller, you personally may not need a baby carrier. How do you travel with a baby in a taxi? Most places in the world allow you to travel with a baby in your lap when you use a taxi. Is it safe to travel with a baby in a taxi without a carseat? No. Do people do it? Yes. If you bring along a carseat it could be a little harder in the airport because it’s one more thing to worry about, but it will give you peace of mind for the rest of the trip. Use a travel seat roller to make it easier to roll around the car seat in the airport. 4. 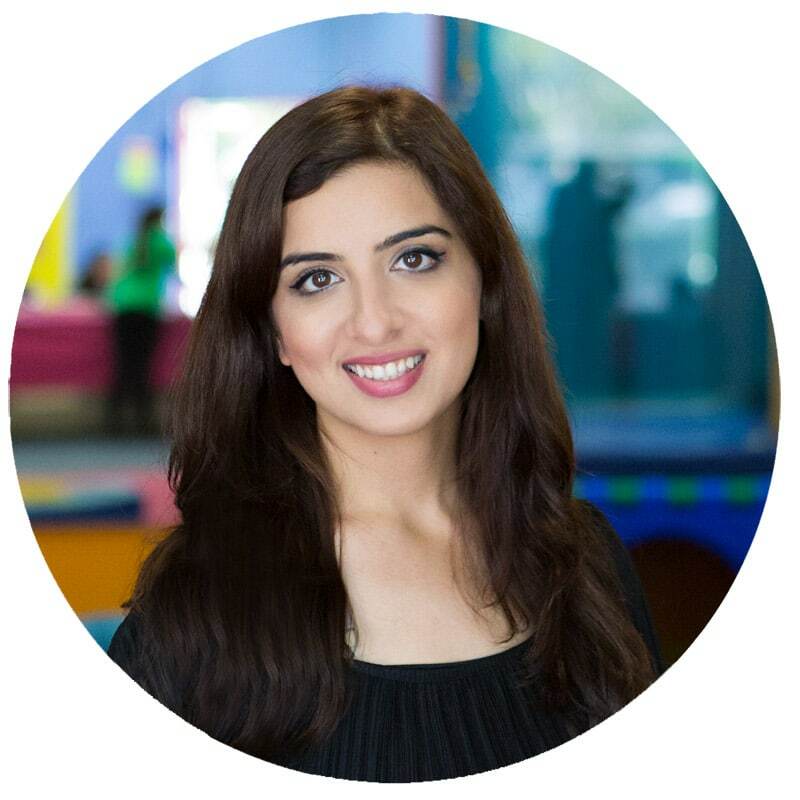 Car seat– I recently travelled with my car seat on board and was amazed at how relieved I felt when my baby was sleeping while she was buckled into her seat. I used the Chicco key fit and was impressed that it wasn’t too heavy. I hate putting my child in the baby cot onboard because firstly it’s dangerous (they aren’t properly buckled!) and anytime there is turbulence they make you take the baby out (this causes many unnecessary wake ups and broken sleeps for Baby and Mom!). You can book a separate seat for your baby (whether this proves to have value to you will depend on how long your flight is) or you can just pray that there is an empty seat in your ticket class. When you check in ask the check in lady if she can place you next to an empty seat because you have a car seat and would like your child to be buckled in. Some airlines have a policy that if there is an empty seat they have to block it off for your car seat for free. Certain airlines also allow you to check your carseat in (as a luggage piece) for free. 5. 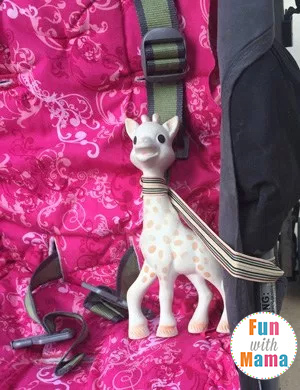 A few little toys– We took Sophie the giraffe (this is a must have baby teething toy). 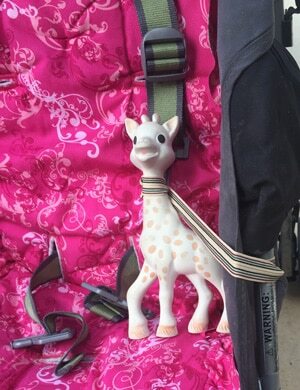 Tie an elastic around Sophie’s neck and tie the other side either on the carseat or the stroller. This will keep your toy from falling on to the floor and getting dirty whenever your baby throws or drops it. 6. Baby Snacks- bring small snacks in a ziplock bag or small plastic containers for your child to much on. Pack a banana, flings or some cereal. I take baby puffs and yoghurt melts. 7. A baby blanket- it gets really cold on the plane so it’s nice to have your own clean blanket that baby can cuddle up with. Having a familiar blanket from home can also relax baby. Your feeding cover can double up as a light blanket too. If we are going to a warm area I take my Adan + Anais blankets. If it is going to be cold I take a warm fleece blanket, which I also use for the airplane ride. 8. Baby bottles, pre-measured formula tin (I like the munchkin one and use it for baby cereal instead) and a small thermos if your child is formula and bottle fed. 9. Pacifiers/Dummies- my third child didn’t normally use a pacifier but I did bring along two to use during our flights. Sucking a dummy helps relieve ear pain from the change in air pressure during take off and landing. 10. Favorite stuffed animal – we have the white one as you can see on our Instagram. This makes airplane nap time that much easier! If all else fails then just take a piece of tape and do this spur of the moment Baby Tape Activity. It might be the best way you’ll keep them seated during landing and take off time. Toddlers are a bundle full of energy and apparently some wisdom too. My toddler has taught me 12 important life lessons! However, flying definitely becomes more challenging at this age. That ever annoying seatbelt sign tends to go on at the most inopportune toddler moment. 1. My number one weapon for toddlers is… Stickers! Stickers have got me through many dreaded “seatbelt sign is on” moments. I save up a few which I don’t show my kids until landing time. This is the time when they are most crabby and just want to get off the plane. Forgot to bring stickers? Use the stickers that are there in your seat pocket (yep the one that says if you want to be woken for meals. Toddlers can’t read yet so they wont notice what it says.) To see exactly which activities and stickers I take click here. 2. iPads loaded with new games and shows- yes the plane has televisions but have you ever tried to look at the tv screen from the your child’s height? The screen looks almost black unless the child is sitting on top of their knees or on top of three pillows. Also, your Childs favorite shows may not be onboard. This works great for taxi rides too! 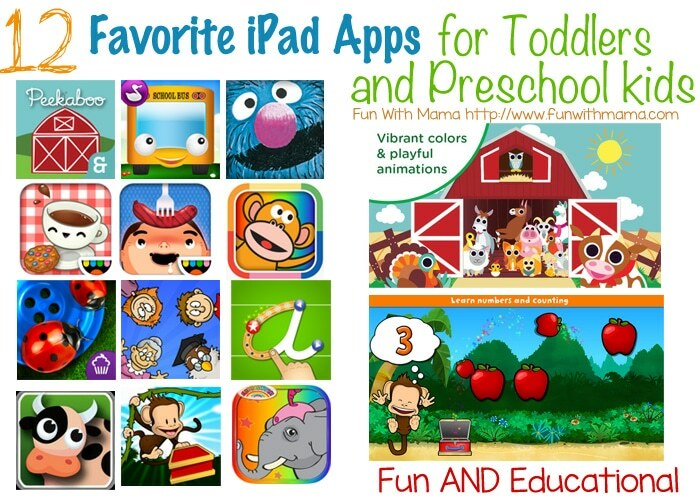 Have a look here for my Favorite iPad Apps for Kids Ages 1, 2, 3 and 4. 3. Headphones– so as not to disturb other passengers. We have Jlab Headphones and Moki too. 4. 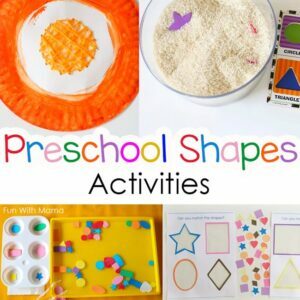 Activity books and crayons– I buy these type of activity books before I leave. I normally take two of these books for international travel. 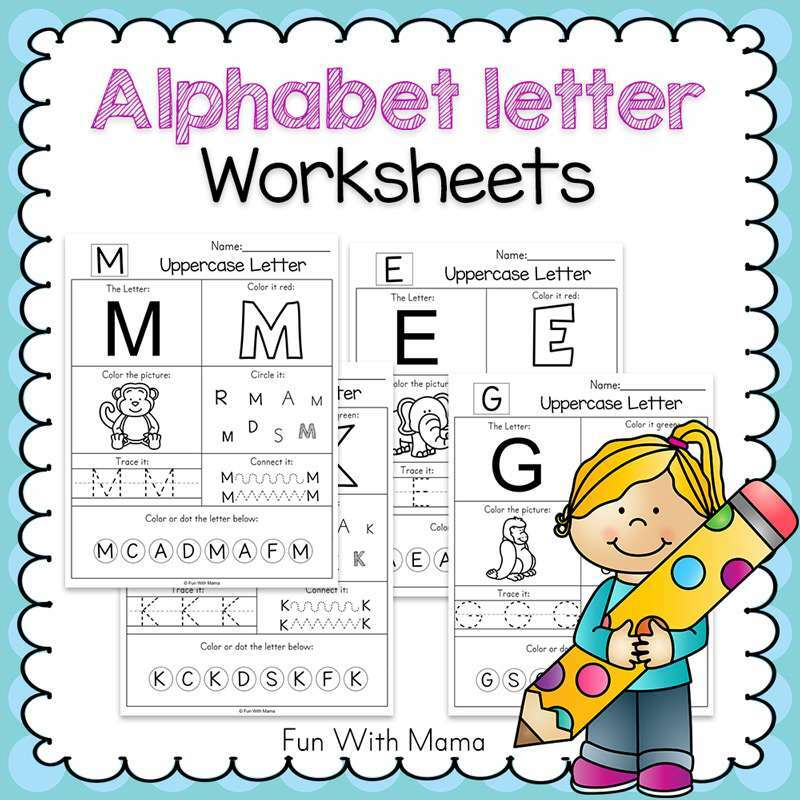 There are stickers inside, mazes, and fine motor activities to keep my kids stimulated and busy. 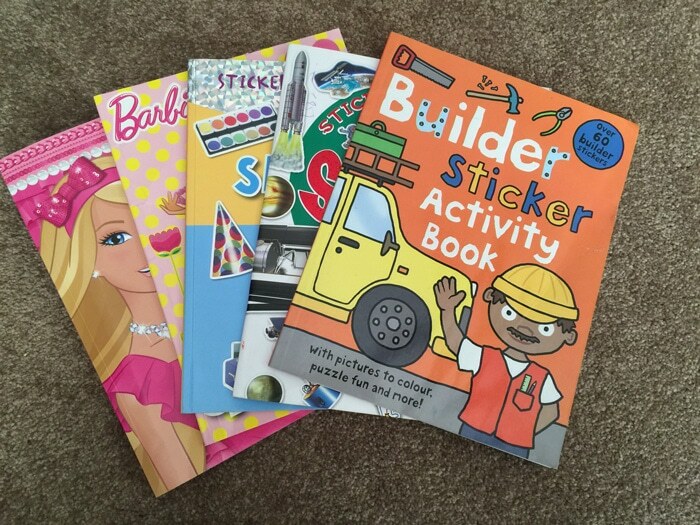 My favorite activity books by far are the ones by Priddy Books (such as the builder one above). 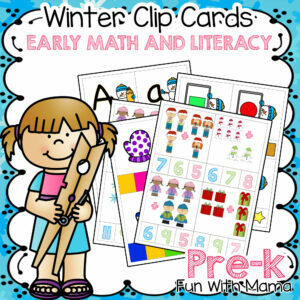 They include a lot of stickers and very fun activities. 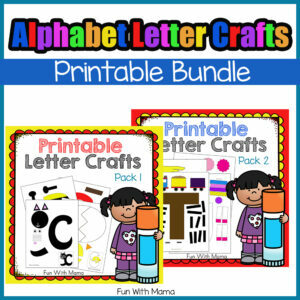 Our favorite is the Preschool Sticker Activity book but I have tried the builder one and many others too and they are all great. 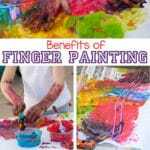 Check out this post to see what other activities I recommend for keeping the kids busy and happy. 5. Snacks for older kids– you can pre-pack a meal from home or little treats that won’t go off quickly. Children don’t always want to wait to eat during the set meal times nor do they always like the food that is served. 6. A change of clothes for each child and parent– you never know who might spill something on their clothes. My seven year old always seems to spill her drink on herself and whoever is seated next to her. I take it as a given that it is going to happen and pack extra clothes for all of us. 10. Favorite stuffed animal – This is still my daughters favorite stuffed animal. 11. During our holiday I love to add this travel activity tray to their stroller while we are walking about the different cities we are visiting. It keeps the little ones happy. Did you wonder how I manage to carry my baby, push my toddler in the stroller, carry my diaper bag and pull my carry on luggage all at once? The baby gets into a baby carrier (hands free), the toddler gets into the stroller, diaper bag gets placed over the handles of my stroller and I lift my rolling hand luggage handle over my strollers handle. 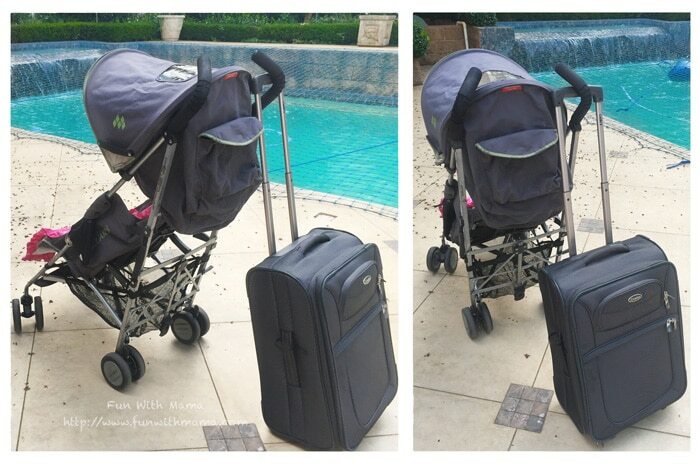 I push the stroller and the stroller pulls my carry on luggage. This works great when you walk in a straight line but when you need to turn you will have to make a wide turn like a truck! Small Update: I found this awesome product called Buti-pod case and they are so tiny. It’s like a small ziplock bag (but not a ziplock) that you can put wipes in and it keeps it from drying out. What I love most about it is that I can now fit these wipes into my tiny daily handbag and now when the kids need a quick face or hand wipe I am always stocked! I also have one of these in each of my kids school bags. Don’t want to buy one? You can try this frugal tip. Place wet wipes into a ziplock bag. A little bit of Dishwashing liquid (to clean up cup, bowel, spoons and bottle) and a small sponge. Extra ziplock bags- trust me you’ll be happy you brought some. 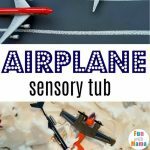 Have you seen my post with travel activity ideas to keep the kids busy and happy (while keeping mom sane!)? I’d love to connect with you on Facebook, Instagram, Twitter and Pinterest. Organize Kids Art supplies with an art cart. 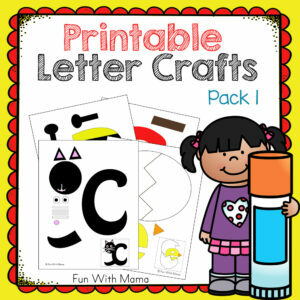 Create this printable preschool cutting busy box. My favorite Toddler and Preschool iPad Apps perfect for traveling toddlers! Dear Toddler, Thank you for teaching me these 12 life lessons. 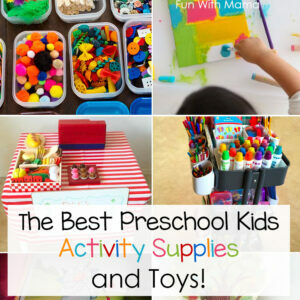 Best Preschool Kids Activity Supplies and Toys. Got an Elmo lover? 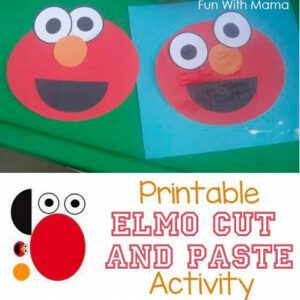 Try out this Printable Elmo Craft. I hope you enjoyed my flying with a baby tips. 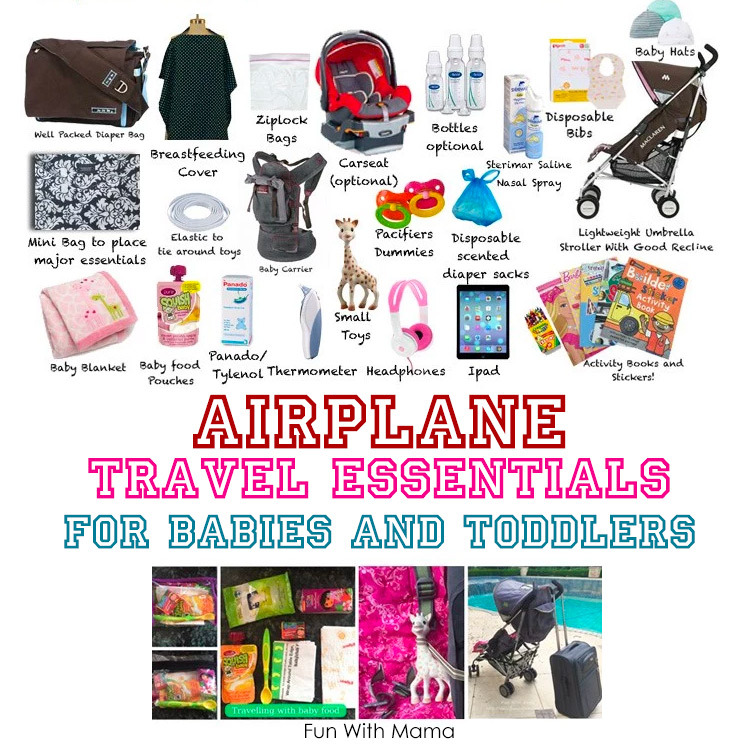 Are there any items you would like to add to flying with a toddler or baby? You are right on track. I don’t think you are missing anything. I remember those days of traveling with an infant and then a toddler. Heck, still til this day when I travel with a now 11 year old, I still take snacks, books and electronic devices. Very informative tips for travel. Traveling with a child takes more preparation. 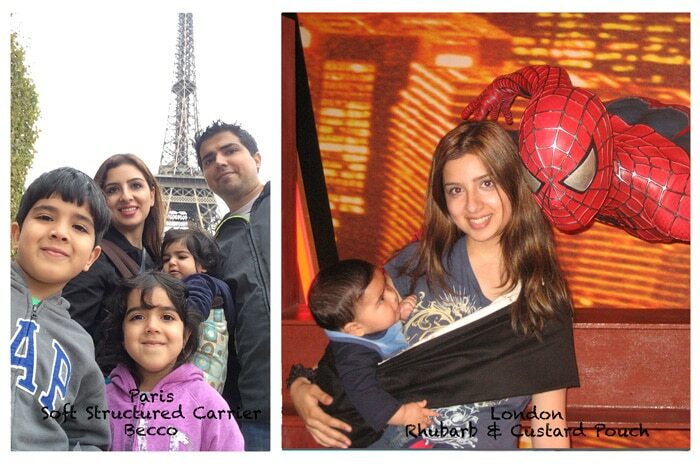 Child’s carrier are very useful when traveling which allow parents to enjoy farther and longer. I just had a look at your piggy back rider. Thats actually a really smart idea. It would be perfect for concerts or events where your child is standing at the back (like disney world) and where they would need a little boost 🙂 My kids would totally love that! Ohhh Thank you so much Nadia. Yes! your kids would really love this carrier and it is perfect for concert ! 😀 also while hiking, touring, shopping, walking, watching, exploring or whatever adventure you may have with kids. We are taking my 15 month old to Disney World next week and your list is going to help a lot! I am unsure of what type of bag I should take as my carry on with all of these items and if I should try to fit it in one or do a tote bag or back pack and then a separate diaper bag? I would love advice on where to pack everything as you mentioned in your article! Do you also have a list of what to pack in your checked luggage/ suitcase? If your flight time is not that long I would suggest that you pack according to that. You definitely don’t want to overpack for a short flight. I would suggest two outfits, extra diapers, wipes, and some teething toys. Stickers are good too!